If you have encountered the Oracle Database wait event log file sync before, you know it can be very difficult to resolve. Even when a solution technically makes sense it can be very challenging to explain to others and to anticipate the impact of your solution. In this post I explore one of the most common performance killing log file sync situations, then dive deep into why it is a problem. Fortunately, I won't stop there because then I will detail how to solve the problem. I will also classify the Oracle Database time components to better understand how to derive that elusive spot-on solution, how to graphically show the situation and how to anticipate your solution benefits before you deploy your solution in a production environment. This is a fairly large and complex topic, so I'm going to break it up into a multiple blog entry series. Thanks for joining me in this journey and let's get started! But first, just what is a log file sync? It is a wait event that a server process posts when it is waiting for its commit to complete. So it's transaction commit time from an Oracle server process perspective. If you want to track commit times, then track log file sync wait times. Every commit contains some overhead, stuff that must occur regardless of how much redo is to be written. Besides the log writer having to immediately write, various memory structures must be updated, and process communication must occur. The log writer likes to pack the log buffer blocks (sized in operating system sized blocks) full of redo entries before it writes. This makes writing very efficient. In other words, if commits are rapidly occurring the log writer is unable to fully pack each block. So if you want to increase the overhead per dml statement, just do commits very, very rapidly. The overly careful and most likely undertrained developer wanted to ensure Oracle committed after each insert. After all, they are thinking, "If I don't ensure the commit, then it may never happen!" By simply moving the commit outside of the loop, log file sync could easily no longer be the top wait event. So one logical solution is to reduce the number of commits while still completing the same amount of work and perhaps even more! But does this really improve performance? And how? And can we anticipate the performance improvement before we actually change the production code? I decided to create an experiment. The actual experimental code is too long to include in this blog, but can be downloaded here. You can't simply run the file. Take a close look at it. You'll notice a few grants must occur, a few objects must be created, and then near the bottom is some SQL to run the experiment, reports to view the results, and finally the raw experimental data. It's all there! Here's the experiment design. To summarize, the experiment simply collects the amount of a single server process and instance CPU time, instance non-idle wait time, and the single server process elapsed time to insert 900000 rows at batch sizes from 1 to 16384. 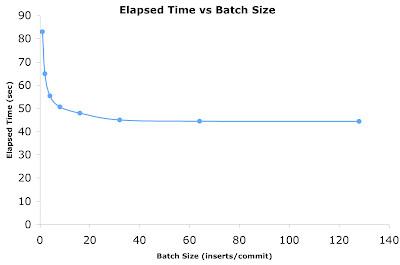 The batch size is the number of inserts per commit. The batch size was altered while ensuring a total of 900000 rows was inserted for each test. I ran each batch size test 35 times. Each experimental figure I refer to in this series is based on a 35 sample average. The experiment was run on a single quad core Intel chip in a Dell computer running Oracle 11gR2 on Linux. What can we expect? 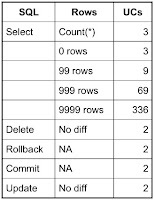 Well for starters, we hope that a larger batch size (that is, rows per commit) will help increase the efficiency of each log writer write, that is, reduce the overhead per insert. Plus other commit related overhead will be reduced. So our hope is the elapsed time to complete the 900000 inserts will decrease as the batch size increases. Here are the results in table format followed by a partial data plot. 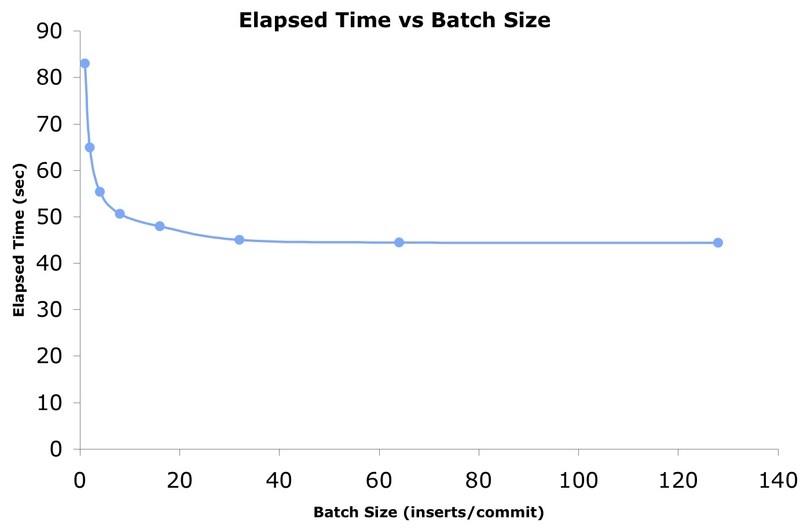 It's pretty obvious from this experiment that increasing the batch size (inserts per commit) made a massive elapsed time difference. 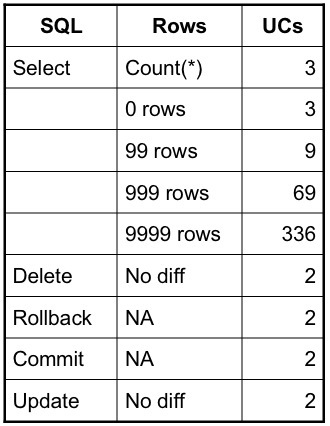 In fact, increasing the rows per commit from 1 to only 32 resulted in a 47% elapsed time decrease! However after this, the batch size increase benefit begins to dramatically decrease to where once we hit around 33000 rows per commit only an additional 3% elapsed time decrease was seen. So creating batches in the hundreds or thousands did not make a significant difference in this experiment. So this experiment demonstrated that (in this case) increasing the number of inserts per commit increased the number of inserts that can occur over a fixed period of time. In part two I will break down the components of the insert time. This will help us to understand how and why batching the inserts improves performance and also sets us up to anticipate the improvement before any changes are actually made. I know many of you don't receive my email updates, so I figured I had better post the details about my upcoming training on my blog. If you have taken one of my courses within the past three years, you can receive a 50% discount for a re-take. I'm always updating my courses and most people are surprised by the number of re-takes. Email me for the discount code. 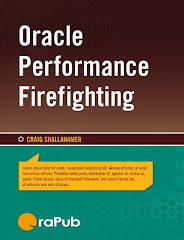 Oracle Performance Firefighting 2010. October in Philadelphia and November on the West Coast of North America. I'm still not decided on a West Coast location. It will probably be Irvine, Santa Clara, or Vancouver (BC). Email me if you have a preference. Advanced Oracle Performance Analysis. October in Philadelphia and November on the West Coast of North America. Oracle Forecasting & Predictive Analysis. August in Washington, DC. This is a very special offering. The recession has all but killed this course (which I absolutely love to teach), but I've been getting enough interest lately that I decided to offer it in a typically central location; Washington, DC. I purposely selected a date that is before a major US holiday and before the craziness of the Fall begins. 2010 One-Day Performance Seminar. September in Tempe, AZ and Tampa, FL, plus possibly two other locations in December. I frequently get asked about the differences in my courses, so here's a summary. Both the Oracle Performance Firefighting and the Advanced Oracle Performance analysis courses are focused on thriving in an existing intense performance battle. The firefighting course weaves together systematic and quantitative methods, diagnosis, Oracle internals, and deriving multiple spot-on solutions that make perfect sense. The advanced analysis course is focused on objectively and quantitatively ranking these solutions and being able to effectively communicate them to management. In contrast, my Oracle Forecasting & Predictive Analysis course is squarely focused on understanding how much your existing or proposed system can take before the wall is hit and the firefighting begins. In other words, you're working to avoid getting into a firefight in the first place. The one-day seminar is a combination of topics pulled from my courses and latest research packed together in a very intense format. I know this seems way out into the future, but I'm already considering locations for 2011. If you would like me to teach in your area (or on-site at your company), just send me an email. And I always try and partner with local Oracle user groups because it's a good thing for everyone involved. Hope to see you personally later this year! The Oracle Database instance statistic user calls is frequently tossed around in casual DBA conversations. But it's like one of those big vocabulary words, corpuscle that's in sophisticated books that we hated to read as kids. And as a kid we were too afraid to ask and too lazy to look up the definition. But once we got a little older we figured out that most people are just as stupid and as lazy as we were. Oracle user calls is like one of those words, except that as DBAs it's very important to understand.